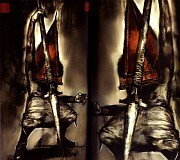 In order for fans of the original Silent Hill to properly enjoy Shattered Memories, it is vital that they throw off notions of wanting the game to be a remake and instead accept it as a completely different game with some ties. Another important thing to keep in mind-regardless of whether or not you are familiar with the Silent Hill series-is that Shattered Memories just isn’t that scary, despite its label as a horror game. While the Silent Hill series is usually filled with intense, bloody environments, Shattered Memories’ version of a frightening “otherworld” is instead the regular world frozen over in ice.